It is safe to say that Team PokerStars pro Jose Barbero is having a good year. Most players are lucky to win three tournament titles during the course of their career, and he has won that many since February. Barbero won the PokerStars Latin American Poker Tour main event in Punta del Esta, Uruguay, and he followed that up with another LAPT main event tournament title in Lima, Peru in June. His latest triumph came at the £20,000 high roller no-limit hold’em event at the PokerStars European Poker Tour London festival of poker. The tournament attracted a very talented group of 77 players and the large price tag created a huge prize pool worth £1,524,600. All of the prize money went to the eight final-table contestants that returned today, but it was Barbero who claimed the top prize worth £556,000. Neuville was eliminated in eighth place and he took home £45,900 in prize money. Will Molson was eliminated in seventh place and he will take home £61,200 in prize money. Marafioti was eliminated on the hand in sixth place and he will take home £76,500 in prize money. Quoss was eliminated in fifth place and he will take home £107,000. 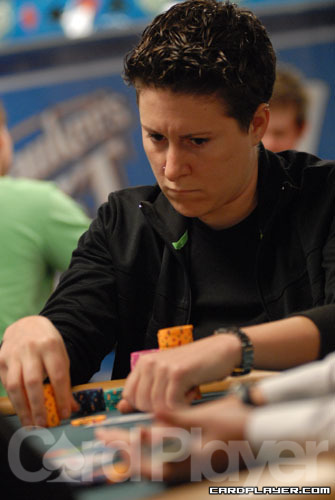 Team PokerStars pro Vanessa Selbst bet 45,000 from UTG. It came around to fellow Team Pro member Jose Barbero and he raised it to 120,000 from the big blind. Selbst then four-bet to 230,000, with about 600,000 behind. Barbero then shoved all in and Selbst made the call. It was a rough elimination for Selbst as the board fell Q 10 6 7 K and she will leave London with £145,000 for fourth place. Robl exits with £190,000 for third place. He leaves Barbero and Jani Sointula to battle over who gets the £556,000 top prize. Team PokerStars pro Jose Barbero has added another tournament title to his collection along with £556,000 in prize money. Jani Sointula is the runner up with and he takes home £335,000. Barbero won the hand and the tournament and Sointula finished runner up.